Thomas Vanek has been traded. When reading this, this was not a shocker, in fact it was somewhat of a relief. Vanek has been the talk of trade rumors for months now and his day has finally arrived: Fleeing Terry Pegula’s so called ‘Hockey Heaven’ (which is now a complete and utter “Hockey Hell” On Ice) and onward to a much better situation. The team he went to with the much better situation speaks volumes to how far the Buffalo Sabres have fallen. The New York Islanders? Yes folks, the New York Islanders. A team that was the poster child for jokes from hockey fans from Draft Day follies to Mike Milbury to Gordon’s Fisherman jerseys, and based off of years of ineptitude just became a player in the Eastern Conference. They have made a statement by trading for Vanek. Does this trade indicate that the Islanders are serious contenders in the Eastern Conference? Probably not, but it shows the fan base that they are serious about trying to keep budding superstar John Tavares happy and provide him with the best talent around him to succeed. Positive Side: The Sabres get a nice return for a player that was not going to re-sign with the Buffalo Sabres. Say what you want about GM Darcy Regier (and we have said plenty here), he has made some very good trades in the past: Regier got a nice haul for former captain Jason Pominville last season, and by trading Vanek early it ensued the best return for a player who could very well be a rental player for the New York Islanders. Assessing the Sabres next 2 seasons in the 2014 and 2015 NHL Draft, the Sabres now have three 1st round picks (2 in 2014 and 1 in 2015) and six, count them, SIX, 2nd round draft picks (3 in 2014 and 2015). The Sabres also get Matt Moulson, who is also a UFA in 2014 and can be traded at the deadline for more draft picks, a probable scenario that will most likely play out. Highly doubt that Moulson as a 29 year old will want to sign with the Sabres who are now a team clearly 2-3 years away from even contending for a playoff spot. Negative Side: Already mired in a horrendous 2-10-1 start to the season, the fan base has to be getting weary. What is the motivation to pay for tickets, parking, food, and sit and watch a Sabres franchise that is clearly telling you: ‘It is time to suffer’ Sabres fans patience will be tested unlike anytime in the franchise’s history. As for the 1st round pick in 2014: It is a nice haul, but consider who is making the picks (Regier) and the fact that the 2014 NHL Draft appears to be a little light on depth, considering the Islanders will at least be contending for a playoff spot so the pick is likely to be around 16-24. Sabres fans also need to understand NHL Draft choices typically are unlike the NBA and NFL: It can take years to see the benefits. Another possible negative: If Moulson finishes the season and walks and no compensation is received. Positive Side: Thomas Vanek, a proven 35-40 goal scorer in the NHL, a player who at times, can take a team on his back. Scores goals in bunches, and shows flashes of being a World Class player. Name recognition: For a fan base starving for an identity, this gives the franchise another jolt heading in the right direction. Islanders GM Garth Snow sends a message that the time is now for the young Islanders to make that next leap. Negative Side: Vanek has been criticized at times for his forecheck, working the corners, and slumps in his career. And is Vanek THAT much of an upgrade in the context of how well Moulson plays with Tavares? Was giving up a 1st in 2014 and a 2nd in 2015 worth that price? Will Vanek stay in NY? The worst kept NHL secret is that Vanek supposedly has a desire to play in Minnesota. If Vanek bolts, and the Islanders miss the playoffs, and get nothing back, this can turn out to be a disaster for Garth Snow, and might ultimately lead to his dismissal. Now that we assessed this trade, what was the REAL motivation? What prompted these two franchises to get together and make this trade at this time? How about General Manager employment? Darcy Regier has rightfully been under fire in Western New York, as Facebook groups like ‘Fire Darcy Regier’ and others have been gaining members at a frenetic pace. This trade ensures his employment to continue with the Buffalo Sabres. Why would Pegula fire the GM who is making these deals for him? It does not make sense. As for Garth Snow, the time is now. He needed to give up the future to take a shot at the present, his job is on the line and the Islanders want to make that leap. if Snow does not improve, he will be out of a job come next summer. 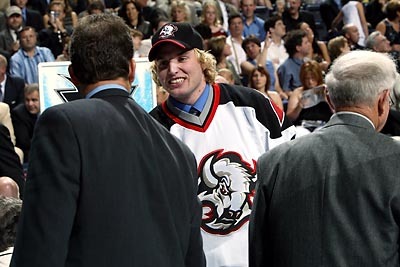 As for Thomas Vanek, it was a pleasure to watch you play for Buffalo Sabres since you were picked 5th overall in the 2003 NHL Draft. we wish you well on Long Island. And we welcome Matt Moulson to Western New York, hope you stay for awhile. But I am sure Moulson will realize this ‘Hockey Hell’ will be too much to take, so we await the latest wave of draft picks with no names yet. Avid fan of the NFL, NHL, NBA and MLB. One thing you will always get from me is passion. Thanks for reading! I’d be shocked if they don’t flip Moulson before the deadline for even more of a return. Darcy does have the rep for only trading if he gets 125% of a value in a deal…that’s not neccesarily a bad thing though sometimes it’s better to get a return rather than none.